Embryo Angling has acquired its first day ticket complex! The complex is called Norton Disney, located halfway between Newark and Lincoln on the A1. The project consists of 6 lakes, on site, ranging from 27 acres down to 8 acres. We now have multiple exciting job opportunities to offer as we create the fishery team. 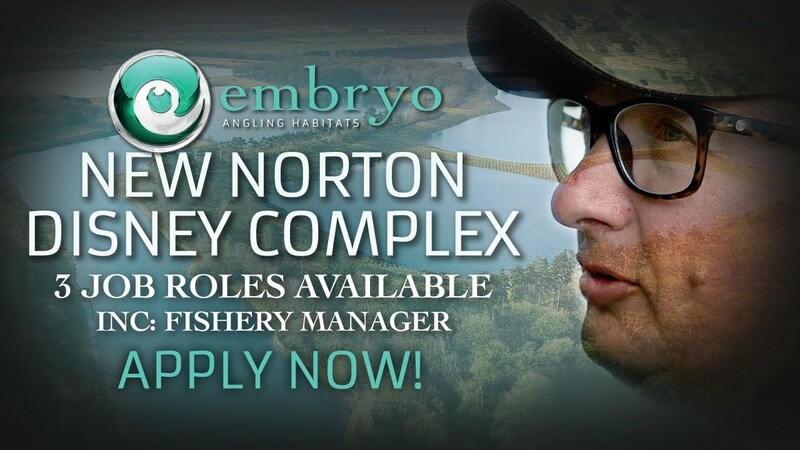 This person a high experienced individual, have a very high man management skillset as you will be looking after your team of staff but also the thousands of anglers passing through the complex. They will be highly professional, diplomatic but also stern when needed. A very well rounded individual capable of keeping detailed records. This role isn’t going to be your standard 9-5, requiring a high level of commitment. A high level of angling skill that can be used to pass on coaching to anglers around the lake is essential, good photography skills are also required to record captures for record purposes and social media use. They must have a massive passion for developing the fishery into an outstanding day ticket complex! The person will be able to take charge of the complex when the manager is away, this person will have a very similar skillset to the Fishery Manager but maybe slightly less experience. This applicant will be trained and given the opportunity to progress to fishery manager level in time. Again, the passion for angling and providing a great service must be extremely high. This role could be for someone who is a graduate of a college such as Sparsholt or Shuttleworth (although this is not compulsory). They must have endless enthusiasm and energy to be around the lake’s day and night. Taking photos and coaching people. Helping with moving fish around the complex. Over time this person will be trained to fishery manager level. Covering letter explaining which role applying for and 200 words explaining why you are right for the role.